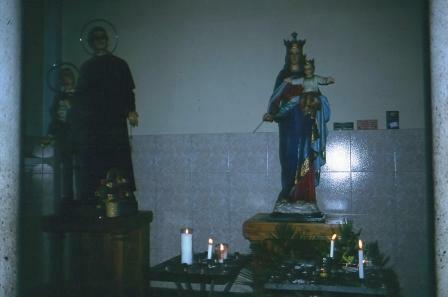 Los Padres de La Iglesia Don Rúa, sus amigos por supuesto, se recuerdan de usted en la misma manera que yo pienso de mi hermana Marilee: serio y enojado, pero al mismo tiempo alegre y juguetón. Every story our family tells begins with, “bueno, era bien serio, como era Padre no se podia andar riendo todo el tiempo.” Very serious at first, and always laughing in the end. 1968 Mom. Cuando se tituló tu papá de doctor, el se emborrachó y alguien le preguntó que comó se iba a entrar a la Iglesia si ya era tarde. Pero el Padre le dijo,”Yo tengo llave,” porque el era medio fantasiosito. Milo y René lo fueron a dejar y cuando llegaron se salto el muro con todo su vestuario, porque no tenía llave. Era ahí en la escuela Don Bosco. 1974 Tío Juan. He was a very serious man. Everything always needed to remain neat and tidy. I remember one time, when we were about to cross the U.S. – Mexican border, the priest needed to stretch out his tired body. He stepped out of the car, only to soil his pants and shoes with mud. Se atasco todo. He was livid, and your father and I couldn’t stop laughing. 1975 Tío Jaime. Someone was hosting a Christmas party a few weeks after the Tio-Padre arrived from Italy. He couldn’t stop telling stories about his trip to el extranjero. Que el extranjero aqui y que el extranjero aya. Lucky for him he was drunk, and didn’t realize that he had annoyed everyone. 1979 Nancy. I was about seven-years-old when he visited Dad, Mom and me at our house on Virginia Avenue in South Gate. I remember mom ironing his clothes. She ironed his underwear once. I couldn’t stop laughing at the thought of a priest wearing red, polk-a-dot boxers. January 2005 Tío Mario, with his cherub-like face, could not help but smile remembering how you always ate candy, or how you always carried a camera and asked people to photograph you…What a charming, Tío-Padre you were. Usted es mi Tío-Padre. Adrianita se rie por el nombre que sus sobrinos le hemos puesto. Es mi Tío Salomón, y Padre de la Iglesia Católica. Y al mismo tiempo, usted, como mi Tía-Abuelita Lydia, fueron los Padres de mi papá. The priests of the Church Don Rua, your friends of course, remember you in the same manner that I think of my sister Marilee: serious and angry, but at the same time, cheerful and playful. Well, he was very serious, since he was a priest he couldn’t go around laughing all the time. Overseas. Overseas here, and overseas there. When your father graduated as a doctor, he became drunk, and someone asked him how he was going to get in the Church since it was already late. But the priest responded that he had a key, since he had feelings of gradeur. Milo and Rene took him home, and when they got there, he had to jump over the concrete wall, priests garb and all, since he didn’t have a key. This happened at the school Don Bosco. You are my Uncle, Priest. Adrianita laughs at the name your nephews have given you. You are my Uncle Salomon and father of the Catholic Church. And at the same time, you, like my aunt, grandmother Lydia, were my father’s parents. "What we talk about when we talk about love…"